The latest big New Japan event, Dominion, takes place tonight in Osaka Jo Hall for the second straight year in a row. Tetsuya Naito has another big challenge for him as the former champion, Kazuchika Okada, looks to reclaim his title once again. 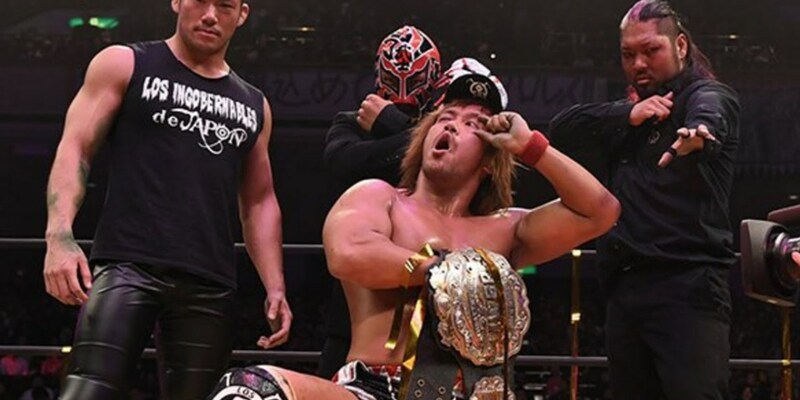 Los Ingobernables have been red hot for most of this year. Will Naito take a loss and try to recoup himself during the G1 tournament or will Okada fail to reclaim the title that Naito's been abusing for the last few months? All major New Japan titles will be on the line tonight as Kenny Omega defends the Intercontinental title against Micheal Elgin in a ladder match, Guerrillas of Destiny defend against the Briscoes, Yuji Nagata defends against former champion Katsyuori Shibata, Best of the Super Juniors Champion Will Ospreay gets another shot at Kushida's Junior Heavyweight title and another fatal four way for the Junior tag team titles will take place, this time being a fatal four way match with Matt Sydal and Ricochet defending against the Young Bucks, reDragon, and Roppongi Vice. The story here is that it's White's last match before he starts next week with ROH in North Carolina. After the match he gave a speech in Japanese. Tenzan, Kojima and Nakanishi were on the ramp clapping for him. The crowd was chanting "Jay" pretty loud. Robinson and Finlay were in the ring on theie knees cheering for him and then they all hugged. The match itself was your typical opener. The announcers were talking about how White as someone who started out there could be the next Prince Devitt or Chris Benoit. Well, you know what they mean. Everyone did their basic spots. Finlay looked good. White tagged in at the end, got some offense, but Tenzan pinned White after a spin kick, an Anaconda buster and a side anaconda vise. Captain New Japan & Yoshitatsu are the Hunter Club, meaning they are hunting the Bullet Club. Not much of a match. Page did a shooting star press off he apron on Yoshitatsu. Page's gimmick as Hangman Page is he uses a bullrope to hang guys. The finish saw Page use the Omori driver on Captain, and really dropped him on his head something sick looking. He then hung him over the top rope with the bullrope after the match. Yoshi-Hashi & Ishii won as expected, but the surprise was that Yoshi-Hashi made Sanada submit to the old WAR special or Rings of Saturn while Ishii had Bushi in a real naked choke. Pretty good match, but short, built around Yoshi-Hashi vs. Sanada going back-and-forth with near falls. Sanada was really the star of the match. When you have Bushi in the match, there's no reason for Sanada to lose the fall via submission at this point. Good match, but not as good as their prior singles match. It looks to be the story of the show is Los Ingobernables are losing all their bouts until Naito in the main event. Goto won clean in a hard hittign match with the final cut after two-head butts and the ushigoroshi, neckbreaker over the knee. The Young Bucks came out and told Gallows & Andeson & Styles "Good luck tomorrow." It's kind of today. The Bucks won the titles clean using the Meltzer driver on Sydal and Matt pinned him. So they have the trios and tag titles. Very good match, not off the charts. Romero was going crazy doing the forever clothesline on everyone until the Bucks threw Romero & Baretta both over the top rope. Sydal & Ricochet a few minutes later threw Fish & O'Reilly over the top rope. Then it was down to a tag. Becaause of the over the top rope elimination rules it took away the dives over the top. They did a lot of near falls. They cut way back on the high flying compared to a usual match with these guys. Great match, but not as good as their first mathc. Kushida worked on Ospready's left wrist early but Ospeay dominateed the second half with all kindsof creative spots including getting out of an armbar into a tombstone into a codebreaker. Ospreay did a middle rope Phoenix splash, a standing Spanish fly and a shooting star press and all kinds of great kicks. Kushida with a flip plancha off the top rope. The finish saw Ospreay rebound off the ropes but Kushida caught him with a hoverboard lock for the submission. They shook hands after. This wasn't as good as the Taguchi or Bailey matches in recent weeks but still best thing so far. The Briscoes won the tag titles with the Doomsday device on Loa and Jay pinned him. Jay had used the Jay driller on Loa before the finish Good match. Mark took a crazy back drop over the top rope. Good match. Tonga is good but is missing something. Loa is just kind of there. The Briscoes were the personality of the match. After the match Page & Takahashi attacked the Briscoes. Page hung Mark over the top rope. Page & Takaashi grabbed the belts so they are going to be the next challengers. This tag division is so weak compared to the other one. I should mention that Shinya Aoki is at ringside with Takaaki Kidani so that probably means something. He's been shown several times but tha was it. This was super. By far the most heated match so far. Shibata regained the title as expected using a choke, Nagata tried to flip him over but it only made it tighter ala the Holm-Tate finish. Shibata then let go just as Nagata was almost otu and hit the penalty kick for the pin. Nagata's mouth was all bloody. Shibata bowed to him when it was over and Nagata whipsered something in his ear. The feud is ove as Nagata raised Shibata's hand while Kojima, Nakanishi and Tenzan all cheered for Shibata. Shibata shook hands with all of them. Nogami was almost in tears as it came across like Nagata's last big hurrah. Lots of hard kicks. Nagata kicked out of Shibata using Nagata's back suplex as well as the Nagata lock. Nagata used Shibata's penalty kick. Lots of suplexes back and forth. Nagata is starting to look old. He can still go. They talked about the 44 year history of New Japan and that history wil take another step for the first ever ladder match. Adam Page and Yujiro Takahashi came out with Omega. No Young Bucks even though Omega & Bucks are trios champs. They are now hanging the belt about 14 feet up. Red Shoes was suspicious of no Young Bucks, searched under the ring, found them and kicked them out. We're four hours into the show and the main event is starting. Another long match ending with Okada winning the title after three rainmakers. Just before the finish Naito had kicked out of a rainmaker which is why Okada felt he needed to keep doing them. It started slow but they went 29 minutes and it was a classic grueling world title match. Naito had used a destino and tried a second one, but Okada blocked it and turned it into a tombstone piledriver. Okada hit a German suplex, Naito tried a Destino and got a near fall with a front rolling cradle until Okada hit the three rainmakers. They did all of their usual stuff but a very dramatic and excellent match. Okada did the post-match promo. No Gedo with him. Okada was a total babyface tonight with Naito booed the entire match. The crowd was reacting big to Okada's mic work. With the G-1 the next big thing no need for any challenges.